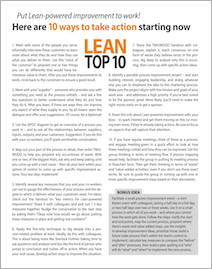 Do you have an internal work process that needs major improvement? 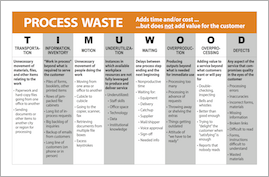 We can provide process improvement facilitation that gets the job done quickly for you. 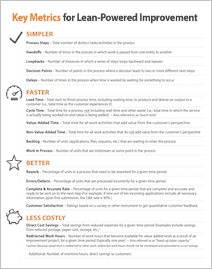 Our neutral status, Lean know-how, and process-improvement expertise add tremendous value from start to finish. To get everything started in the right direction, we work with the sponsor(s) to clarify the project, define the scope of the process to be improved, and develop a thorough project charter. Our charter template is the best in the business. Then we facilitate the team sessions. 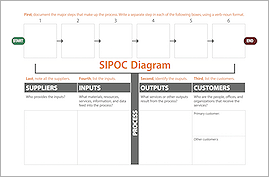 We use a Lean-powered blitz approach, with the project getting done in a week-long Kaizen event – or in two sessions, each lasting two or three days. 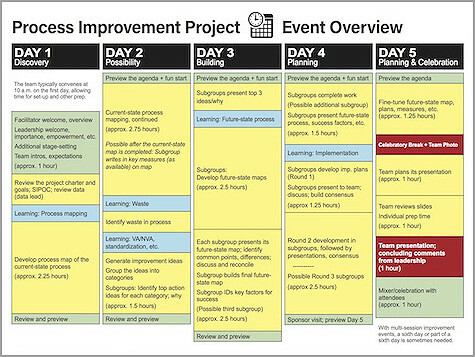 During its time together, the team maps out the current process, uses measures to deepen its understanding, identifies value-added activities and occurrences of waste, develops a package of high-impact improvements, maps out a future-state process, calculates key “before” and “after” measures, builds implementation plans, and presents to workplace peers and leadership. When the team concludes its work, the team leader or project manager becomes the implementation point person. 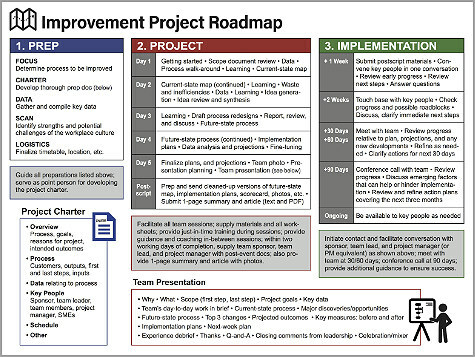 They use the team-produced plans to ensure follow-through and keep everything on track. We participate in two or three update meetings attended by all team members. This is an important opportunity to check progress, clarify upcoming action steps, and provide any additional guidance to ensure that implementation keeps moving forward.